Identical Twins F/O Bruce and Douglas Warren of Nanton Alberta, Canada pictured in September 1942 alongside Doug’s Spitfire Mk. V of No. 165 Squadron RAF. The Warren twins joined the RCAF on March 14, 1941. Assigned to 165 Squadron RAF in the Spring on 1942, they often flew as each others’ wingman. Warrens were re-assigned to No. 66 Squadron RAF in early July of 1944. 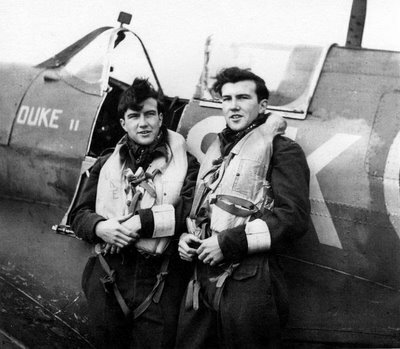 The Warren twins were not only identical; they kept calling each other “Duke” and this made it rather difficult for their Squadron mates to determine who was who. The ground crews came with an idea of distinguishing them by mark numbers. Bruce was nicknamed Duke Mk I and his Spitfire was coded SK-M serial AR403. Douglas was Duke Mk II, his Spitfire coded SK-F with serial BM367. Both Spitfires carried the nicknames painted just below the windscreen on the port side, as shown on the photo. Both Warren twins survived the Second World War and went on to post-war careers in the RCAF. Sadly, Bruce was killed in April 1951 while test-flying the Canadian all weather fighter CF-100. Douglas went on to fly Sabre jets in Korea with the USAF and remained in the RCAF until he retired in the rank of Wing Commander. He lives with his wife Melba in Comox, British Columbia. The Warren twins were both awarded the DFC on the 23rd of March 1945 at Buckingham Palace. At the Investiture HM King George VI said he did not remember ever awarding the DFC to a set of twins. Douglas Warren had a frightening experience on his 44th operational sortie during his service with No. 66 Squadron RAF. Flying a mission to bomb heavy artillery sites near Calais on September 17, 1944, Duke II was hit by an 88 mm anti-aircraft gun. The shell exploded below his Spitfire. Pieces of flak passed right through the wing of the aircraft and into the cockpit. One piece drove the trim wheel into the pilot’s leg and tore through the Mae West glancing off the “D” ring on his parachute. Then it pierced through his pocket and a small metal box that was in the pocket. The metal box was part of a survival kit that contained water purification tablets. The flak piece was red hot, set the kapok from his Mae West on fire and then remained in the metal box smouldering. I was interested to read the following article about Bruce and Douglas Warren. Could you please get in touch with me as I have an article that may be of interest to you. The Warren twins were billeted in Swansea with my cousin Jean Armor and her family for a time during WW2. During our visit several years ago, Jean told us about her Canadian airmen. I think it was an exciting time for her. Jean died in December 2011 and her nephew, Gerrard, now lives in the house. He recently sent us your photo of Bruce and Douglas. We were working with Jean on a family genealogy so any other photos or information about Bruce and Douglas Warren during the time that they were posted in England would be of interest. My friend, Mark Matthys, owns the farm where Bruce Warren crashed in the CF100 in 1951. It’s thought that his oxygen supply failed and he passed out. There wasn’t a set of controls in the rear seat so an Avro employee died also. Mark is a private pilot and has named his farm’s airfield Warren Field. He has found many fragments if the crash, the plane buried itself in the ground so deep that nothing was recovered at the time. Fragments of the plane and a portion of human skull have been revealed with the heaving frost. Mark has a Facebook page – Warren Field.